Recovery from exercise can be sped up by using the Firefly, and this same technology has also provided quick relief for those suffering from Restless Leg Syndrome. Delayed onset muscle soreness or DOMS occurs when exercise places unaccustomed load on muscles causing microscopic tears in the muscle fibers. It generally begins about 12–24 hours after exercise and can continue up to 72 hours. This typically includes local muscle pain, swelling, stiffness, and a temporary reduction of strength in the affected muscles. An active recovery product like Firefly is portable and easy to use – whether at work, at home, or anywhere in between. Use coupon code catalyst4fitness for 5% off! 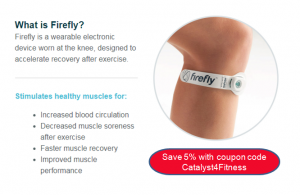 Firefly speeds up the body’s recovery process, allowing you to train again quickly and at a high intensity. It is more effective than ice baths, compression socks, and anti-inflammatory products. Don’t forget – use coupon code catalyst4fitness for 5% off! The Firefly recovery device is the bomb. Let me explain that this is not some high-priced professional athlete-only product. If you have sore legs, ankles, or feet for any reason, from exercise to everyday activity, this is not only better but also faster than any copper socks, compression socks, or heating pads. It is more affordable and so easy to use. Plus each set lasts for 30 hours. Here is my personal story. I workout regularly, taking Metabolic Explosion Training, that keeps me, at 52 years old, able to do all the things I want and enjoy doing. On this past Saturday morning, I started on a patio project that included laying 4 tons of flagstone and 1 ton of stacking stone. It also happened to be 90 degrees outside. After 10 hours of grueling work, my legs from the knees down were killing me. They ached so much. I used the Firefly for an hour and the recovery was unbelievable. For just a $1 an hour, this device works miracles. Whether you are a professional-level or Olympic athlete, or a weekend/armchair QB, this is the best product I have found that really works. I suffer from Restless Legs Syndrome. Usually I lay down for just a few minutes and then my legs start up. For the past three nights though, I have used the Firefly for 30 minutes on the lowest setting before going to bed. It has stopped my restless leg syndrome each of those nights!